Friends, his baggage weighs a ton. If you have ever been...the word I want to use is "victim," but maybe that's unfair. If you have ever been the object of cowardice, the one most immediately left standing all alone by it, watching this film may feel like having your heart ripped out and thrown on the floor all over again. But that sense of loss is not at all the only emotion at play in, or inspired by watching, Kapurush, which is one of the reasons it's so good. 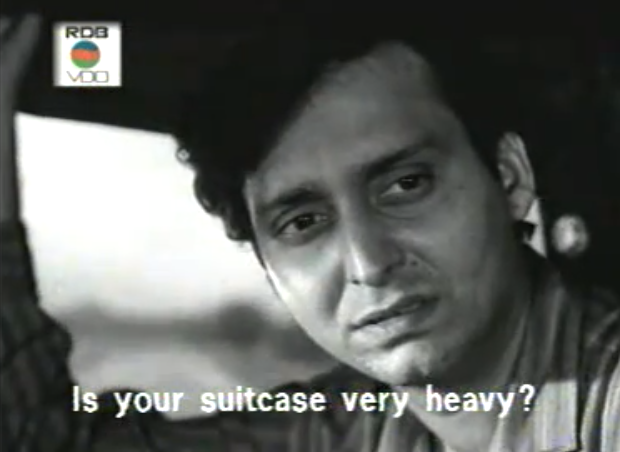 The meet-cute and early phase of Amitabh (Soumitra Chatterjee) and Karuna (Madhabi Mukherjee)'s romance are so cute, even as the issue of cowardice appears almost from the beginning. SO CUTE. Based on my extremely limited sampling of Indian films outside of mainstream Hindi cinema, I am happy to cede the majority of subsequent attempts to depict actual emotional and/or physical intimacy to the Bengalis. Maybe I've just encountered an unusually wonderful sample so far, but there seems to be a maturity to these relationships that keeps the fun, connectedness, and heat but loses the stalking, grabbing, and silliness. I wouldn't put money on it, but as far as I remember all the scenes of them touching or holding hands have his hand on the bottom, meaning he offered his first—hardly the mark of a coward, especially as he talks about how Indian society doesn't really let unmarried couples be brave or bold or outward in their declarations and explorations of love. Then again, the coward is also wise: it seems to me that Ami really was at least as much not ready to take a leap with Karuna all those years ago as he was afraid to do it, and leaping into a marriage when the social and economic cards are stacked against you is a huge risk, so I cannot really fault him for not being willing to take it. There is a literal shadow of a doubt between them. His apartment during that scene looks almost exactly like Apu's in Apur Sansar, and while we could hope that Ami and Karuna would have been as happy as Apu and Aparna were in that tiny, grungy flat, I just don't think Ami is ready for Karuna put a flower pot on his windowsill or leave a note under his pillow. He doesn't think he could raise anything, or even grow himself, and he isn't willing to try or to sacrifice her happiness (and comfort) in the attempt. Karuna rejects his statement about needing more time to make a decision because to her it seemed that what he needed more of was love. If he had had enough love, there wouldn't have been any need to make a decision. That is what is so tragic to me about this story and so often in real life, too: there are just so many factors in a successful relationship, and you can find someone, and love them, and understand them, and they you, and none of that is enough if an unconnected third party throws a wrench into the system you thought you had. Ami is too young, too unrooted to be flexible about such a big question. When the pressure comes, he snaps. But look at him now. He's so brave—foolish? solipsistic? unseeing?—that he delves back into that relationship and its unfinished end while he is completely dependent on her husband. I love the contrast of his insistence now with his uncertainty in the past. When Karuna desperately needed an answer from him, he couldn't give her one; now, when he demands to know something about her life that feels critical to him, she won't tell him, probably because it's none of his business. Later she finally answers "Perhaps I didn't want to be happy," and I am almost wild with curiosity about what that means. Has she made a very filmi character-type self-sarificing decision to resign herself to a life of unhappiness? Has she decided that her happiness is somehow irrelevant? Does she not value it? Does it seem impossible and therefore not worth even trying for? She's so...solid, so calm, that I have to think she has decided that happiness is a concept that neither applies to nor affects her. It's as though he might as well be asking her if she speaks Martian: of course she doesn't, and she doesn't have any need to. It's a much subtler version of the sort of angry, fiery response from wronged women we see in brasher stories: "You forfeited the right to even mention my happiness when you chose to break my heart." Their last exchange is over her sleeping pills that he inadvertently packed in his bags. This is, of course, miles from what he hopes has brought her to the train station. The fact that it's sleeping pills has to be significant: it's not aspirin she wants, but something that knocks her out, dulls her, lets her find some hours of peace. When I think that the ending of Kapurush is sad because Karuna and Ami are clearly never going to reunite, I keep coming back to these pills. She needs her peace back from him—and you don't need sleeping pills if you can rest, if you are well. She is still agitated by him. Whether in a good way, a loving way, a parted but still romantic way, we do not know. What we do know is that what seems like resolution to Ami (her running away with him) seems like an intolerable disruption to Karuna, and therefore it does not happen. Yet she calls him "dear one" again (at least in the subtitles), their hands touch again, giving me the sense that there is still a connection between them, even if nothing further is ever built on it. ...Which almost makes me sad all over again. That's the worst part about dealing with a coward: they tend to leave things unfinished. * Do we think this is the first public juxtaposition of Kenny Rogers and Satyajit Ray? 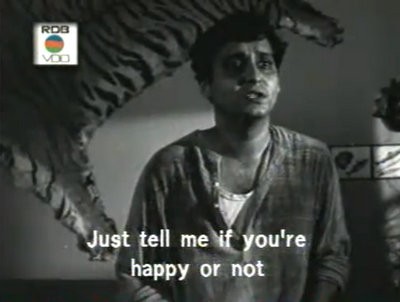 Gah, I can't believe I'm a Bengali and haven't watched any Ray other than Goopy Gyne Bagha Byne yet! Madhobi Mukherjee is lovely. I remember when Vidya made her debut in Parineeta, a lot of the grownups in our circle of acquaintance noted with approval her resemblance to Madhobi, particularly in Charulota, in which she is once again both unhappily married to someone else and hopelessly entangled with Soumitra. I totally chime in with your analysis and what is more, with your questions and thoughtful remarks. I loved your perceptiveness about that shadow on the door, what you make of it - such things normally don't escape me and I hadn't seen it. And of course your two main remarks, about Kuruna's answer on happiness and the sleeping pills at the end, have been exactly what I wondered about too. Please go and check what I thought and let me know if you agree - I am almost 100% behind your opinion ("she has decided that happiness is a concept that neither applies to nor affects her") but not exactly for the same reason. I don't quite believe it is because Amitabha has lost any right to asking her that question. About the sleeping pills, yes! "she needs her peace back from him", as you very astutely say: but what's her peace? Doesn't it mean her own way of dealing with her womanhood, the way she's chosen it, the way she wants it to be, intimately, personally, without any men to tell her what hapiness should be? It isn't a happiness which radiates and envelops her, okay, but it's what she's decided for herself, and it's her history, her life. Thanks again, If you don't mind, I'll add a link to your review on the blog. Hi Sal - Heehee! Consider yourself in good company - there are a ton of classic American films I haven't seen. :) I can see the resemblance of Vidya to Madhobi, and my recent binge of Bengali films has made me want to rewatch Parineeta anyway. And Charulota is in my queue for this week. EEE excited to see it! Hi Yves - I'll go look at your writeup (and of course feel free to link - thank you). As for writing about Ray, I've seen it tons of places that are NOT blogs about Indian films. Sort of related, I've watched a few much more recent and mainstream-y (I think) Bengali films and found few blogs mentioning them either (newspapers, yes; personal sites, no). I have thought of when I watched it. I did not think that the reason why Karuna rejected his statement was because of what she thought he needed ... it was simply because she had no choice. If her uncle was not moving, she might have well been happy to give him time, but the circumstances left them no choice. Also, the scene you post with Soumitra's hand under Madhabi's is one where (If I am recalling things correctly) he offers to use his palmistry 'skills' to foretell her future. Now, I believe this was supposed to be an innocent excuse to hold hands, and I gather that this was a common ploy to achieve the goal of holding hands without owning up to the real reason to do so. So, at some level this may be more indicative of cowardice than daring. Finally, I had never thought much about the sleeping pills beyond the fact that perhaps not all is perfect in her current life ... which provides some context to the conversation about whether she is happy or not. Maybe there is a significance in her going to get the pills from Soumitra, but I have never thought about it. What I thought she tried to do in her snub was clarify her reasons for rejecting his proposal. If she simply did not turn up, it would have left the question open as to whether she did so because she did not want to go with Soumitra, or because she was scared of the risk it entailed (What if she was found out?). But, by going all the way to the station on the pretext of getting back something as trivial as her sleeping pills, she showed that this did not bother her at all. rgb - All very interesting points. I would probably be wise to watch the film again before discussing them more; fortunately my very own copy of the DVD is on its way to me. :) I will say I think there's a lot going on in this film despite its short run time, and I can easily imagine that each viewer will make something slightly different out of it. I wouldn't count the palmistry move as cowardly, really - it's not exactly overt and flying in the face of convention, but surely if this was a common ploy then she knew exactly what he was doing. Even if it's not societally brave, it's interpersonally brave? "I wouldn't count the palmistry move as cowardly, really -"
I was trying to point out that the context to that picture made it less daring, and went overboard on that one. Threading that back to the topic of cowardice is probably a tad harsh and uncalled for.